Beartown Brewery was founded in 1994 in Congleton. It produces a range of quality and distinctive cask conditioned ales, using only traditional brewing methods and the highest quality malted grains and whole hops. 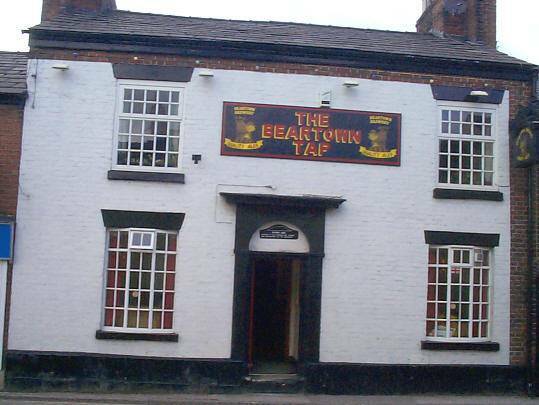 Congleton is known as 'Beartown' by virtue of its history. In the year 1272 the town was granted a charter which gave it borough status. At this time, the most senior positions within the borough were those of the Mayor, the Ale Taster and the Bear Warden. The Ale Taster was employed to ensure that all the ale produced in the local 'ale shoppes' was of a drinkable quality, and the Bear Warden had the job of procuring a fighting bear for the various fairs and celebrations which took place within the town. In 1632 the serving Bear Warden had insufficient funds to purchase a bear for the annual wakes fair, so rather than face the wrath of the local merrymakers, a decision was made to take the money required to buy a bear from the fund. The pub is situated about 3/4 of a mile from the railway station. It's all down hill on the way and can be done in 15 minutes. On the way back it seems like forever uphill. Congleton is a small station and so it's best to know exactly when your train comes. Also check for disruptions at weekends (no I'm not bitter!). The Tap resembles a house inside with two small rooms and the toilets directly up the stairs in front of you as you enter - so no good for the disabled. To the left is a seating area with bench seating round part of the wall in red velvet. The rest is stools and round tables. 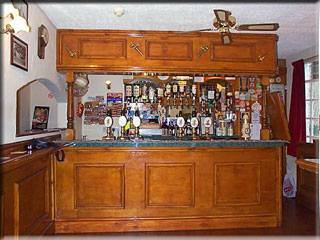 The second smaller room is behind the bar and there is a large arch hatch which provides access to the bar for serving. This is a no smoking bar, but can still receive residue from the bar. A fireplace is in this room too, but we are not sure it is working. Seating is again a bench round most of the wall and round tables and stools and chairs. The bar itself is all wood and has an overhang for glasses. The ornate bar back has been covered with pump clips and certificates (note the rather rear window humour posters). On the bar this time were 4 Beartown beers and one guest from Leydon. All were served with a sparkler, though they tasted better with it off. Prices are very keen, this being the brewery tap (a half and a packet of nuts for a quid). The bar has some stools to it's left and it's here you will find the noticeboard(s) with all things beer on them. The atmosphere is jovial and they only sell real foreign beers - so the bottle crowd don't invade at the weekend. Can get a bit smoky from cigarettes, even when not overly busy. The toilets are clean, but upstairs and you constantly get the feeling you are in someone's house. Other than that this is the best place for a drink in Congleton. No accommodation here.